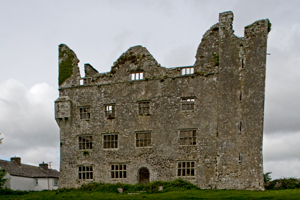 Leamaneh Castle (also spelled Lemaneagh) is near Kilinaboy, in County Clare, Ireland. The castle ruin is a fortified house attached to the original tower house. The castle is not open for touring, but you can drive to the side of the road and park to view the castle and take some photos. The tower house, built in the late 1400s, has a spiral staircase and was built for defense. One hundred and fifty years later, the four-story stronghouse and an attic was added to Leamaneh Castle. The house has its own entrance, offices, a kitchen on the ground floor and living rooms above. Large windows were added over the years as the need for defense decreased. In front of the castle was a bawn with a gateway which was removed and taken to Dromoland Castle, Ireland, in the 19th century. 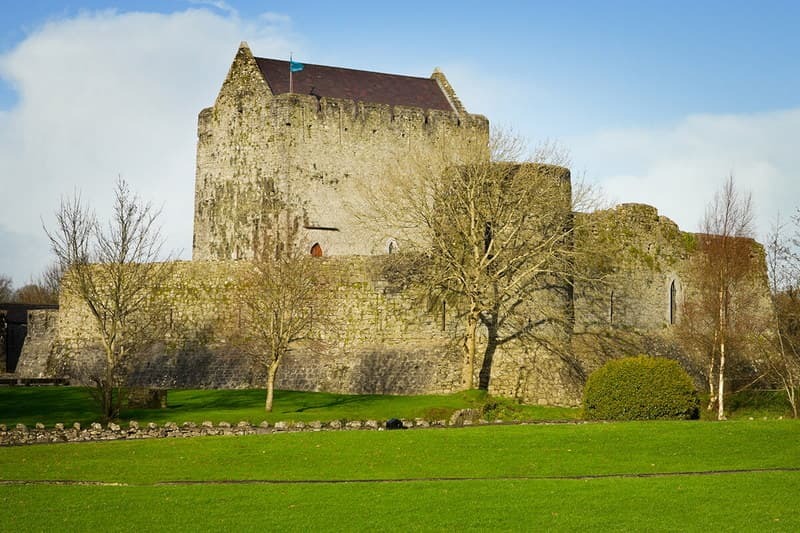 The castle, an O'Brien stronghold, was granted to Donough O'Brien in 1550. Donough was hanged in 1552. Conor O'Brien inherited the property in the 1630s. Maire Rua MacMahon married Conor after her first husband died. They had eight children before he was killed by Cromwellian forces in 1651. There were many stories about Maire Rua (Red Mary) of Ireland. Legend has it that she hung her disobedient men servants by the necks and her maids by the hair from Leamaneh Castle's corbels (stone brackets). She was also known to go with her husband on raids. When Conor was mortally wounded in the fight with Ludlow's army in 1651, Maire Rua refused to open the gates, and, instead, said "We need no dead men here". After she found out that Conor was still alive, she took him in and nursed him until he died a few hours later. Ludlow later stayed in Leamaneh Castle for two nights, but went back to Limerick because he couldn't stand the bad weather. Maire Rua married a Cromwellian officer named Cooper after O'Brien was killed. She got married so her son would have claim to the O'Brien estate. Another Irish legend describes how Maire Rua kicked Cooper out of an upper castle window after he was rude about her previous husband. Maire is said to be buried in Ennis Abbey next to her former husband O'Brien, whom, it is said, she always loved. The castle was abandoned in 1705 and became a ruin. While I was at Leamaneh Castle, some friendly folks suggested that I look at the burial tomb just down the road through the Burren. The tomb at Poulnabrone was on my way to Ballyvaughn where I would see Newtown Castle, so I took their advice. The drive away from Leamaneh will take you into the heart of the burren. You won't want to miss this beautiful and stark expanse of Irish landscape. myguideIreland help you create Ireland Vacations where you can pick your destination and be your own tour guide. Continuing north on the R480, you will come to the entrance of another popular spot named the Aillwee Cave. If you are in this area of County Clare, you will want to explore the cave and have a snack or lunch at the tea room and restaurant. I had a bit of trouble finding the castle when I drove from Ennis to Dysert O’Dea castle and then continued on to find Leamaneh. I used the GPS system and it got me to the town of Kilinaboy. However, I then read the map incorrectly and went in the wrong direction. Luckily, some roadwork was being done and the road was closed. A friendly worker told me to go back to Kilinaboy and start again. I finally found the castle. To get to Leamaneh from Ennis, take R476 northwest through Corofin and Kilinaboy and continue a short way to R480. Turn right onto R480 and the castle is on your left near the intersection. Here is a map of the area near Leamaneh. You will want to spend a bit of time in this area of County Clare. You will be near the Cliffs of Moher, the town of Doolin, and the Aran Islands, just to name a few wonderful destinations. Have fun!